The aims of this project were to improve the appearance of the Bealach na Ba viewpoint car park by providing an interpretive feature, and a welcome into Applecross. The Bealach na Ba (Pass of the Cattle) is the UK’s highest mountain pass and the main gateway to the Applecross Peninsula. The dramatic, twisting single track road to Applecross over the Bealach na Ba climbs to a height of 626 metres (2,054 feet). It is popular with visitors (travelling by car and by cycle) and many stop at the car park close to the top of the pass to enjoy the magnificent panoramic views over the peninsula and Skye. This car park is really the only safe place to park and enjoy the pass. However, previous interpretive provision in the car park was limited to a very simple panoramic viewpoint (with no interpretive content) with old seating in need of replacement and no shelter from the elements. 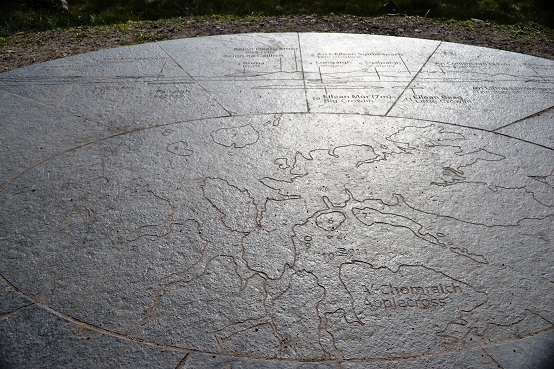 Based on feedback from the community it was felt that an interpretive piece was needed for the top of the Bealach, outlining each of the mountains and islands that can be seen (on a clear day). It was also felt that this interpretive piece should be as natural as possible. So, a design was commissioned for a stone seat with an engraved picture of the view. Dan MacRae was recruited to build the drystone seat, which he did using stone from the Bealach itself. Large slabs of Caithness stone were positioned in front of the seat with an engraving of each of the mountain ranges, the islands and the names of each in both Gaelic and English. Dan laid the stone and a path to the seat and the finished work is spectacular. When the view is clear, visitors can now see where Applecross sits and what they are looking at. It is a spectacular welcome to Applecross.